The first recounts in Florida's contested elections began Sunday morning in two large Tampa Bay counties, after the secretary of state ordered reviews of two nationally watched contests, reports AP. Neighboring Broward County's recount was delayed Sunday due to a technical issue with one of the tabulation machines, while Palm Beach County supervisor of elections, Susan Bucher, says she doesn't think her department can meet a Thursday deadline to hand over duplicated ballots sought by Gov. Rick Scott's Senate campaign. "Bucher insisted that she’d bring officers to forcibly remove any member of the media who filmed the process," @luluramadan writes. This in a public meeting that journalists have filmed for decades. The Florida secretary of state ordered the recounts Saturday, "an unprecedented step for the two flagship races in a state that took five weeks to decide the 2000 presidential election," according to AP. Florida's counties have until 3 p.m. Thursday to complete their recounts. According to unofficial results, Republican former US Rep. Ron DeSantis was 0.5 percentage points ahead of Democratic Tallahassee Mayor Andrew Gillum - who withdrew his concession in the Florida gubernatorial race. DeSantis is proceeding as if he's won and has activated a transition team. In a Saturday video statement, DeSantis said the results of the election were "clear and unambiguous" and that he was preparing to become the state’s next governor. He also thanked the state’s supervisors of elections, canvassing boards, and the staffs for “working hard to ensure that all lawful votes are counted,” according to AP. Meanwhile, Republican Gov. Rick Scott's lead over Democratic incumbent Bill Nelson has fallen to less than .025 percentage points, which has triggered a hand recount of ballots from tabulation machines which were unable to determine who received a vote. "He is trying to commit fraud to win this election," Scott said while appearing on Fox News, adding: "Bill Nelson’s a sore loser. He’s been in politics way too long." Neither the Florida Department of Law Enforcement or the state elections division say they have found evidence of voter fraud. 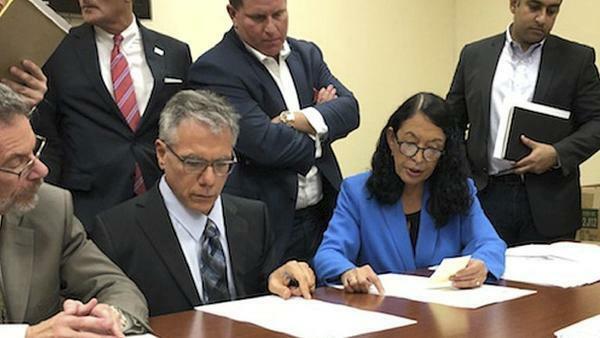 As we reported Saturday, Broward County Supervisor of Elections, Brenda Snipes, missed a court ordered 7PM Friday deadline to allow for the immediate inspection of mysteriously found ballots. Workers were filmed by Rep. Matt Gaetz (R-FL) shuffling boxes into a truck, before he was forcibly removed by a police officer. Meet Brenda Snipes, the ballot magician who has a history of illegality in #BrowardCounty - illegally destroying ballots & announcing results before polls close!